Concrete Robert Ashley’s latest multimedia opera took us someplace we’d never been before: deep inside the composer’s most personal memories. Sasha Cooke After an arresting summer cameo at the Bard Music Festival, this young mezzo served notice of a major talent on the rise at Zankel Hall in October. ICE Burg The International Contemporary Ensemble set up shop in Brooklyn in spring, and promptly mounted its biggest, most diverse New York season to date. Il Barbiere di Siviglia How could the Metropolitan Opera improve Bartlett Sher’s winning new production? By adding spunky mezzo Joyce DiDonato to the mix. 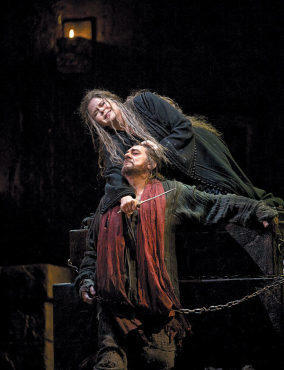 Iphigénie en Tauride Susan Graham and Plácido Domingo were riveting in this profound Gluck drama, while director Stephen Wadsworth deftly balanced the mythic and the intimate. American Composers Orchestra A characteristically bold slate of premieres at Zankel Hall in October was derailed by inadequate preparation and awkward presentation. Lucia di Lammermoor A heroic effort from Natalie Dessay in the Met’s first big fall premiere couldn’t enliven Mary Zimmerman’s dull production. 1 J.S. Bach Goldberg Variations (Telarc). Simone Dinnerstein’s intensely personal take on this keyboard cornerstone polarized critics…and became a runaway hit. 2 Steve Reich Music for 18 Musicians (Innova). Michigan’s Grand Valley State University New Music Ensemble made a disc of the minimalist masterpiece that won the composer’s approval. 3 Osvaldo Golijov Oceana (Deutsche Grammophon). Dawn Upshaw, the Kronos Quartet, Robert Spano and the Atlanta Symphony demonstrated the infinite variety of the Argentine composer’s music. 4 Robert Ashley Now Eleanor’s Idea (Lovely Music). More than a decade after the last performance of Ashley’s freewheeling lowrider exegesis, recording technology has finally caught up. 5 Tristan Murail Winter Fragments (Aeon). Michel Galante’s excellent Argento Chamber Ensemble made its CD debut with crystalline landscapes from a modern French master. 6 Sibelius and Lindberg Violin Concertos (Sony Classical). Lisa Batiashvili reveled in the cool fire of Sibelius’s familiar showpiece, and introduced a new classic by Magnus Lindberg. 7 Bridget Kibbey Love Is Come Again (self-released). With playing, production and packaging as gorgeous as local harpist Kibbey provided on her first CD, who needs a record label? 8 Mark Padmore As Steals the Morn… (Harmonia Mundi). Handel recitals arrive more often than crosstown buses, but British tenor Padmore commanded respect for his poise and precise diction. 9 Ludwig van Beethoven Symphonies Nos. 3 and 8 (RCA Red Seal). Paavo Järvi and the Deutsche Kammerphilharmonie turned two well-worn standards into brisk, bracing voyages of discovery. 10 Michael Harrison Revelation (Cantaloupe). Pianist-composer Harrison documented his just-intonation solo manifesto, and the results were completely absorbing. Report card: Given Carnegie Hall’s “Berlin in Lights” extravaganza and the Met’s continuing adventures under Peter Gelb’s watch, it’s no surprise those organizations dominated the scene. The New York Philharmonic hid sparks of ingenuity within massive thickets of Brahms andTchaikovsky, while New York City Opera soldiered into the fall without an artistic director at the helm. The best news: Contemporary-classical initiatives such as Wordless Music, Darmstadt, VIM: Tribeca and the MATA Festival continued to flourish in a real-estate–challenged market.